Good news and bad: the good news is that there's a new Dark Souls 2 trailer and it features lots of killing and dying and resting at bonfires. The bad is that Dark Souls 2 won't release until after the console editions, which have been confirmed for launches on March 11 and 14 in North America and Europe respectively. According to a Eurogamer report, game director Yui Tanimura hopes to release the PC edition in the same launch window. "For the PC version we're simply saying March - we're trying our best for PC and console," he said . "The reason we can't announce the specific date is we're working on more options on how to make the PC version optimal." Tanimura also assured PC owners that problems with the Dark Souls port won't be repeated, as the current game is being developed with both consoles and PC in mind. In other Dark Souls 2 news, From Software has detailed some of the ways its gameplay elements will differ from its predecessor. 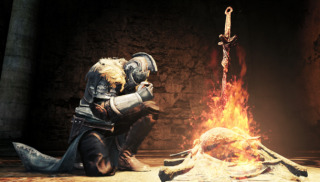 During a presentation attended by Gamespot , reps from the studio confirmed undead players can be invaded, in contrast with Dark Souls' requirement that the player character be in human form. Perhaps to offset the pain this will inevitably cause new players, a new covenant entitled 'Way of the Blue' will allow invaded players to summon help. Meanwhile, players will be able to summon players for periods longer than a boss battle. The period will be determined by the size of a player's White Soapstone, which will be depleted as the summoned player kills enemies in the host player's world. Also: remember being cursed in Dark Souls? Remember how much that sucked? Well, that appears to be a stock standard mechanic in its sequel: players who die while undead will see a gradual depletion of their health bar until they use a Human Effigy unit, which will replace the Humanity in Dark Souls. Prepare to die indeed.